Trying to stay warm on my winter Camino de Santiago pilgrimage. Previously I’d seen both sunshine and chilly rain on my walk. Nowadays I’m seeing straight up winter weather. In the mornings, the puddles on the path are frozen over. I’ve taken to hiking in my down jacket more often than not. One afternoon there were even fat, wet snowflakes dowsing me for over an hour. The wind is crazy too. My cheeks are often red and my hair is tangled from the constant wind. And it’s the worst when it’s blowing against me while I walk. The Camino does not have many trees to block the elements. A frosty morning on the Camino. I’ve basically had the same group of friends for the entire Camino. I met them on the very first day. There are four Italians, one Spaniard, and then me. Like I said previously, I don’t understand what’s going on most of the time because of the constant Italian speaking. And boy, do Italians like to talk. I don’t quite know what they’re talking about, but they seem to know everything that’s going on with everyone. For example, a few days ago I stopped at the pharmacy to buy Ibuprofen after I had dinner with my friends. I told only one person where I was going. By the time I got to the albergue, everyone knew I had gone to the pharmacy. Two different people asked me what was wrong and if I was OK. Another two admonished me for not coming to them first because they would have been willing to share their own pain killers. So perhaps the Italians talk about everything and everyone. I got to visit the Cathedral in Burgos, Spain. When I reached the city of Burgos, I wanted to take a rest day as I had not had one yet. However, only my friend Manuel wanted to take a day off with me. The rest of the group wanted to continue. On my day off, I went sight-seeing at the Cathedral which is almost 1000 years old. Then I needed a new pair of tights, so I walked across town to a store called Decathlon. It is basically the mecca of cheap athletic clothing. I wanted to buy everything, but I restrained myself. For real though, my yoga tights only cost 13 euros. Town was a sight for sore eyes after a long day. After a whole day off without our crew, Manuel and I missed the others. We decided to try to catch up. The next day we awoke at 5:30 am and set off. It was so early that we walked with headlamps for the first hour of the frosty morning. By 4:00 pm, after over 40 kilometers of walking, we hobbled our way into the only open restaurant in Castro Jeriz. One thing I like about Spain is that many of the restaurants give you multiple courses with your meal for one price. You get bread, wine, a first course (soup, salad, etc. ), a second course (meat and a side), and a desert. It usually costs anywhere from 8-12 euros. Being well fed, we made our way to the albergue to prepare to do the same thing all over again the next day. I discovered a blister on the bottom of my foot that was three inches long. Additionally, my Achilles heel was swollen and painful. The next day went on in a similar fashion. We awoke early in the morning and spent the entire day walking. We hoped to find our friends that evening. However, on this day we were sore from walking the equivalent of a marathon the day before. And now we were trying to walk another marathon. By the afternoon my feet were in pain with every step. The temperature dropped and it began to rain. The final 10 kilometers was down a dirt path right beside a highway. I was hungry and in a bad mood. Manuel is an exceedingly optimistic person and was trying to keep my spirits up by telling me to “just be happy”. I wanted to push him into oncoming traffic. However, I restrained myself and tried my best to remain polite. Finally, we arrived in Carrion de los Condes and went straight to a restaurant for a hot meal. We must have been a damp, bedraggled spectacle because they brought a heater right to our table. By the time we finished dinner it was dark and we left in search of the albergue. This one was ran by nuns, and they scolded us for walking so far and fussed over us as we checked in. We were shown to the communal room and all of our friends were there. It was a happy reunion and worth walking 80 kilometers in two days to all be together again. After two really big days, we did short and easy days for a little while. I had to let my blisters and heel get better. I’m exceptionally bad at relaxing though. One day I arrived at my destination at noon and after journaling, reading, and wasting time on the internet was still bored. I decided that the next day I would do nearly 40 kilometers again into Leon. My friends were not planning on going to Leon, but in the end they all made the big day too. I felt good afterwards, and I think I have recovered from my ailments. 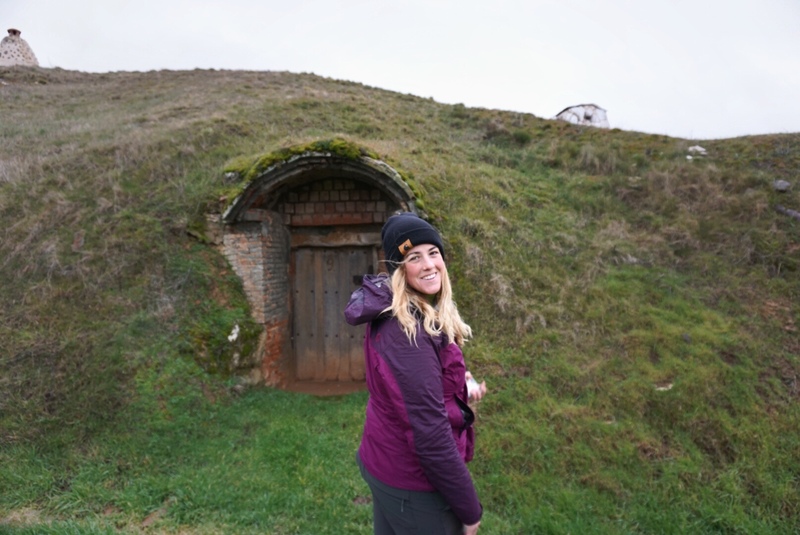 Checking out some hobbit homes along the Camino. One cool thing that’s been on the Camino recently are things that look like hobbit homes. In actuality, they are bodegas that are over 500 years old. Local families have used them for wine making and storing cheeses and meats. I’ve seen them a few times. One hillside even had about eight of them. The sign I read said that they were possibly dug by children who needed an activity to keep them warm in the wintertime. The Camino has been mostly flat recently. Soon I will be hiking into the mountains and possibly through snow. I will be happy for the challenge and change in scenery if that’s the case. Great memories from following you on your Camino, I can really identify with the group dynamics. Thanks for the opportunity! Buen camino. Yeah, the group has been such a fun part. Thanks for reading! Loving your updates. Thank you. Thanks for sharing Megan! Cant believe you walked that many kilometers in a day. My husband and I just walked a portion of the camino in October and could have never done that amount in a day! Well done and Buen Camino!! I also can’t believe I walked that far in a day!!! Really enjoy reading your posts! Great way to relive the Way 🙂 Looking forward to more. I appreciate reading your blog and the colorful and well framed photography. I walked 150 miles this last June stopping in Burgos as I ran out of time. I hope to return in 2020 to finish. I’m glad you’re enjoying my photos. I get really into it! Enjoy finishing your Camino. Thanks for complimenting my writing. I appreciate it!